A white background, with black or sometimes red lettering, indicates a regulatory sign, such as a speed limit. Yellow conveys a general warning message: Railroad Crossing or Deer Crossing. Green indicates permitted traffic movements or directional guidance, such as mileage to the next city. Fluorescent yellow/green indicates pedestrian crossings and school zones. Orange is used for warning and guidance in roadway work zones. Absolutely! 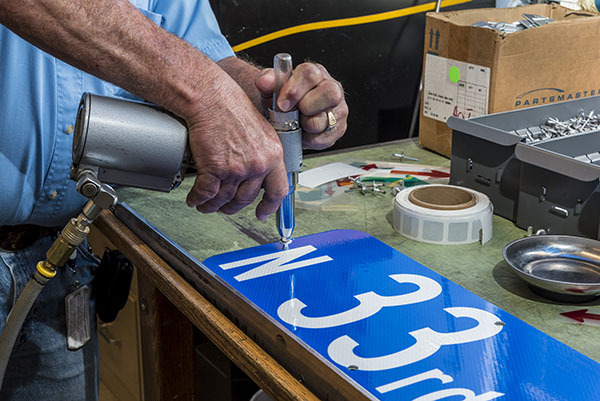 While it is not cost effective for the ACHD to make signs used in high quantities, such as Stop Signs, this team stays very busy! 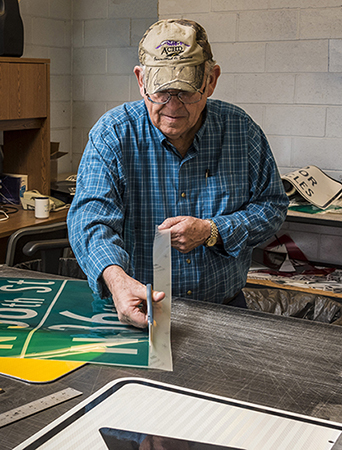 The sign shop produces between 2,500 and 3,000 signs per year!